APROFURSA E30820 ALCANTARILLA - Murcia – (Spain) Aprovechamientos Energéticos Furesa S.A. 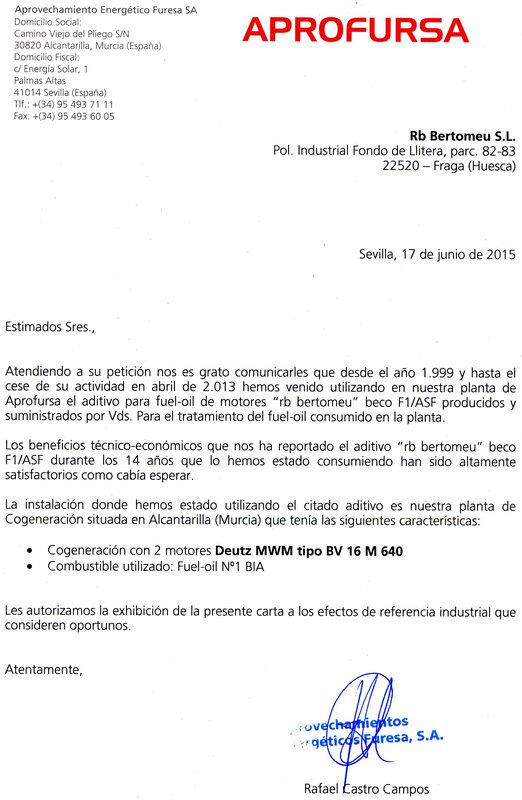 In reply to your request we are pleased to comunicate that from 1999 until the cessation of activity in April 2013 we have used in our Aprofusa power plant the fuel oil additive "rb bertomeu" beco F1/ASF manufactured and delivered from you to treat the fuel oil consumed in the plant. The technical and economical benefits that the additive "rb bertomeu" beco F1/ASF has delivered throughout these 14 years have been highly satisfying as expected. In reply to your request we are pleased to comunicate that since 1,999 we are using the fuel oil additive "rb bertomeu" beco F1/ASF and also de Cleaner product "belim F" , both of them manufactured and supplied by your company. The obtained results , technical and economical, are as expected when we decided to use them.